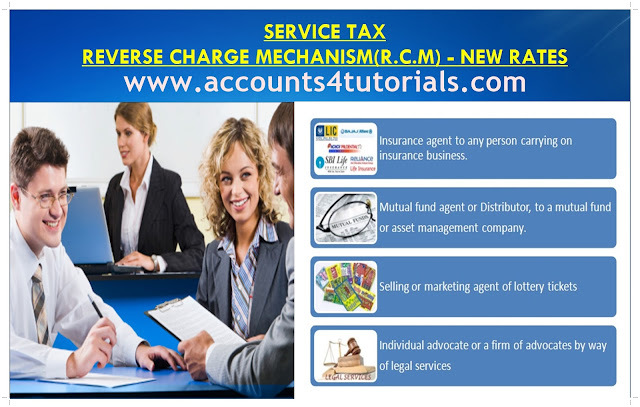 This is glimpse of the Reverse Charge Mechanism (R.C.M.) [as amended from time to time] applicable from 01.04.2015.The following table shows such taxable services in which the extent of service tax payable thereon by the person who provides the service and the person who receives the service. Effective rates of R.C.M. as applicable are stated considering the increased service tax rate from 12.36% to 14% w.e.f. 01/06/2015. Partnership firm including association of persons. * In Sl No. 6 & 10 indicates that the rates are subject to the type of service provided.